South Korea's Unification minister Cho Myoung-gyun guides Kim Yong Nam and Kim Jon Un's younger sister Kim Yo Jong to a meeting room in Incheon today. North Korea’s ceremonial leader and US Vice President Mike Pence may have their first face-to-face encounter today at the opening ceremony of the Pyeongchang Winter Olympics, as Washington prepares more sanctions against the North. 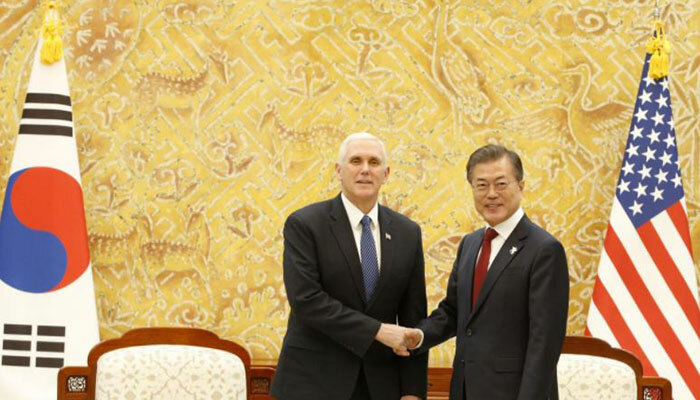 Any contact between the two will likely be tense after Pence said South Korean President Moon Jae-in gave his backing to additional measures the United States is planning to try to curb North Korea’s missile and nuclear programmes. Pence said Moon acknowledged the effectiveness of sanctions in bringing North Korea to inter-Korean talks. “President Moon reaffirmed to me his strong support of our extreme pressure campaign to continue to bring additional sanctions on North Korea,” Pence told reporters. He spoke after paying tribute at a memorial for 46 South Korean sailors killed in the sinking of a warship in 2010 that Seoul blamed on a North Korean torpedo attack. Pence arrived in South Korea on Thursday and spoke with Moon, both reiterating their commitment and cooperation to defuse tensions as North Korea pushes ahead with its weapons programmes in defiance of UN Security Council resolutions. Kim Yong Nam, North Korea’s nominal head of state, landed in South Korea today along with leader Kim Jong Un’s younger sister, Kim Yo Jong, aboard her brother’s private jet. The white aircraft had Democratic People’s Republic of Korea, North Korea’s official name, inscribed in black in Korean on its side, followed by the North Korean flag. Smiling and seemingly unfazed by cameras flashing during the airport meeting, Kim Yo Jong wore a black coat, matching ankle boots and carried a black purse. Dozens of South Koreans at the airport tried to snap photos of her on their mobile phones. 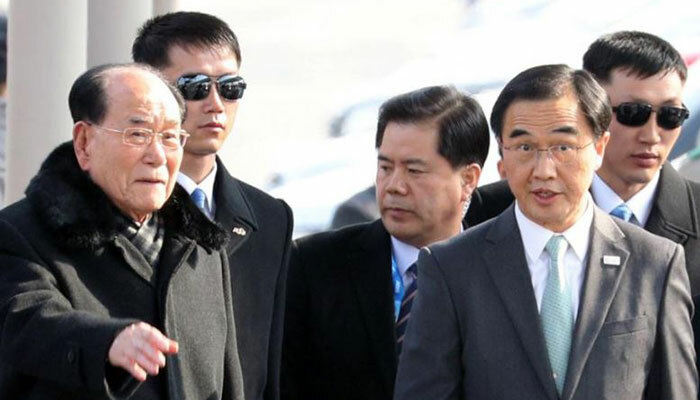 The pair will have lunch with South Korean President Moon Jae-in on Saturday, Moon’s office said. Pence has kept open the possibility for some contact with the North Koreans in South Korea, while reiterating Washington’s insistence that denuclearisation by North Korea is a necessary condition for peace. Pence, Kim Yo Jong and other world leaders will attend the opening ceremony in Pyeongchang, just 80 km (50 miles) from the heavily fortified border between North and South Korea, later today. ”Moon regime is leading Korea to destruction” read one of the banners the protesters were holding up. Moon will hold a welcoming reception for his top guests before the Games open, a presidential official said, where Pence and Kim Yong Nam could sit at the same table with Moon. South Korea hopes the Olympics can demonstrate its efforts to defuse tensions and foster inter-Korean rapprochement, and athletes from the two Koreas will march together under one peninsula flag for the first time in more than a decade. Nearly 500 North Koreans have arrived in South Korea for the Olympics, which run through to February 25, including a cheering squad, art troupe and taekwondo demonstration team. However, the inter-Korean Olympics detente has raised concerns in Washington and Tokyo that Seoul may undermine the US-led campaign of global pressure to get Pyongyang to abandon its nuclear and missile programmes. Moon held a summit with Japanese Prime Minister Shinzo Abe on Friday, during which they discussed the North Korea standoff and the sensitive issue of “comfort women”, a euphemism for girls and women forced to work in Japan’s wartime brothels. In opening remarks provided by the Blue House, Abe said he wished to reaffirm close cooperation between Japan, South Korea and the United States in regards to North Korea. Abe said before leaving for the Olympics he wanted to convey to the world that that cooperation “will not waver”.